Introduction: Any phenomenon, which produces pressure change within an aquifer, results into the change of ground water level. These changes in ground water level can be a result of changes in storage, amount of discharge and recharge, variation of stream stages and evaporation. External loads such as tides, trains, atmospheric pressure and earthquake are born in part by the ground water of confined aquifers. Hence they affect peizometric levels. The general consideration is that due to any reason if the aquifer pressure rises above the atmospheric pressure an upleveling in ground water level results and vice- versa. There are two broad kinds of level variation. Secular variation: These are variations in ground water level extending over a period of years. Alternating seasons of wet and dry years is which the rainfall in above and below the mean respectively, produce long period fluctuation of level. Recharge is the governing factor, which depends upon the rainfall intensity and distribution and amount of surface run off. In over developed basins where draft exceeds recharge, a down ward trend of ground water level may continue for many years. Seasonal variation: These results from influence such as recharge from rainfall and irrigation and discharge by pumping which follow well defined seasonal cycles. Highest levels occur about April and lowest about September marking the beginning and end of the irrigation seasons. There are several factors, which claim the ground water level to change. These are as follows. 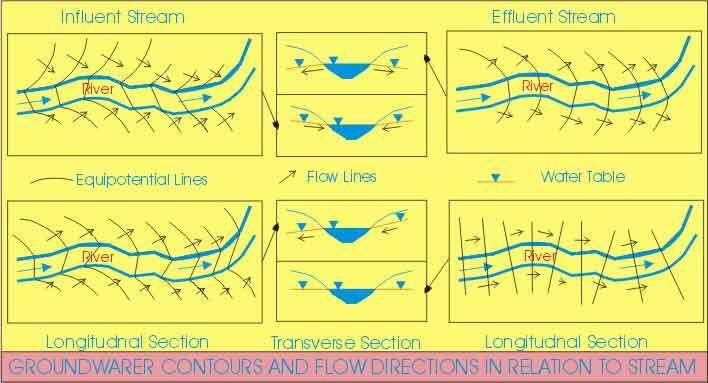 Due to stream flow: Where a stream channel is in indirect contact with an unconfined aquifer the stream may recharge the ground water, or receive discharge from the ground water (termed as influent and effluent streams respectively streams respectively depending on the relative water levels. During a period of flood, ground water levels one temporarily raised near the channel by the inflow of stream. 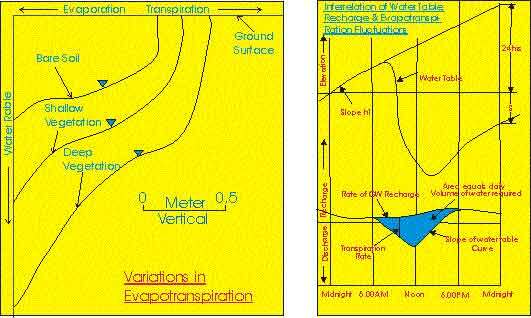 Due to evapotranspiration: In areas where the ground water level is very near to the surface, evaporation plays a dominant role in reducing the ground water level. Laboratory experiments have shown that if ground water level is in the range of one foot below the surface the highest rate of evaporation occurs and the ground water level reduces to 3 to 4 feet, after that certain limit the effect of evaporation does not occur literally. The maximum water table level occurs in midmorning (figure) and represents a temporary equilibrium between discharge and recharge from surrounding ground water. From then till early evening losses exceed recharge and the level falls. The steep slopes near midday indicate maximum discharge associated with highest temperature. The evening minimum again represents the equilibrium point, while the rise during the night hours is recharge in excess of discharge. White suggested method of computing the total quantity of ground water with drawn by evapotraspiration during a day. Assuming that evapotraspiration is negligible during midnight to 4 A.M., then the hourly recharge from midnight to 4 A.M. may be taken as the average rate for the day. Letting ‘h’ equal the hourly rate of rise of water table from midnight to 4 AM as shown in the figure, ‘s’ is the net fall or rise of water table during 24 hrs, then as a good approximation of diurnal volume of the ground water discharge per unit area. VET = Sy (24 h + s), Where Sy is specific yield near the water table. Due to atmospheric pressure: A change in atmospheric pressure is inversely proportional to water table level in confined aquifers. When atmospheric pressure changes expressed in terms of a column of water, the ratio of water level change to pressure change expresses the barometric efficiency of an aquifer. Most observations yield values in the range of 20 to 75 %. The explanation of the phenomenon can be given by assuming that aquifers one elastic body. +Pa = +Pw + +sc ----- (i) , Where +sc is the increased compressive stress on the aquifer. It is apparent that +Pw < +Pa indicating that H¢ < H. Generally therefore, the water level in a well falls with an increase in atmospheric pressure. For an unconfined aquifer atmospheric pressure changes are directly transmitted to the water table in the aquifer and a well, hence no fluctuation results. Due to wind: Minor fluctuation of water levels is caused by wind blowing over the top of wells. The effect is identical to the action of a vacuum pump. As a gust of wind blows over the top of a casing, the air pressure within the well is suddenly lowered and consequently the water level rises. After the gust parries the air pressure in the well rises and water level falls. Due to rainfall: Annual ground water level fluctuation results from seasonal variation of recharge from rainfall. Due to ocean tides: In coastal aquifers in contact with the ocean fluctuation of ground water level occurs in response to tides. If the sea level varies with simple harmonic motion, a train of sinusoidal waves is propagated inland from the submarine outcrop of the aquifer. With distance, inland amplitude of the waves decreases and the time lag of a given maximal increases. Due to Earth tides: Regular semidiurnal fluctuation occuring in small magnitude located a great distance from oceans has been attributed to earth tides; resulting from the attraction exerted on the earth’s crust by moon and to a lesser extent by sun. At times of new and full moon the tide producing forces of the moon and sun act in the same direction, then the ocean tides play a greater than average range. But when the moon is in the first and third quarter, tide-producing forces of the sun and moon act perpendicular to one another, causing ocean tides of smaller average range. 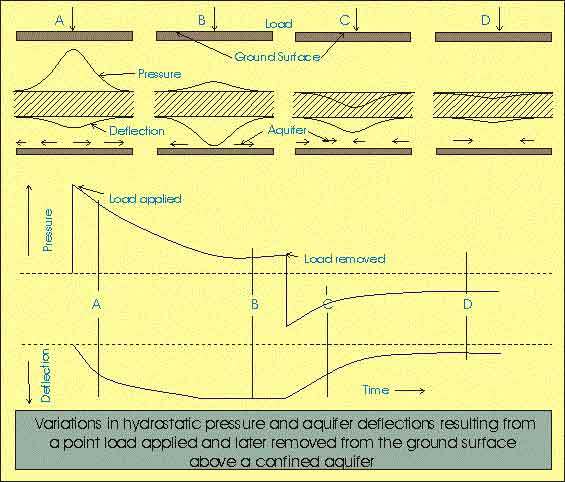 Due to external load: The elastic properties of an aquifer (confined) result in changes in hydrostatic pressure when changes in loading occur. Some of the best examples are exhibited by wells located hear railroads where passing trains produce measurable fluctuation of piezometric surface. Due to Earthquakes: Observations reveals that earthquakes have a variety of effects on ground water. Most spectacular are sudden rises and falls of ground water levels in wells, changes in discharge of springs, appearance of new springs and eruption of water and mud out of the ground. Earthquakes produce small fluctuations in the wells penetrating confined aquifers. The earthquake waves travels at speeds of approximately 125 miles\minute so that the fluctuations appear after little more than one hour even from the most distant earthquakes. Drains are proved useful in controlling the ground water levels. Drains are designed in several ways. Some are composed of coarse sand gravel so that their permeability is higher than the surrounding porous media. Drains have many applications. An earth dam usually contains a drain near its toe to prevent saturation of downstream face. Most foundation of structure contains drain around their perimeter to reduce hydrostatic pressure of water entrance. Modern highways often contain sub drains to avoid saturation of the high way grade. On agricultural lands, adequate drainage system is essential for stabilizing water tables below the root zone. High water levels may result naturally in flat lands, bordering rivers, lakes or the oceans. To regulate water levels within narrow limits over a large area, drains are laid in parallel lines at depths and spacing governed by local crop and soil conditions. Pumping wells also may control water levels; the process being identical to wells providing water supplies. Well points, are lines of small diameter wells most often installed for dewatering surface construction site. Relief wells are placed near the toes of dams and levee’s to lower water table there by reducing uplift pressure produced by seepages under the structures.